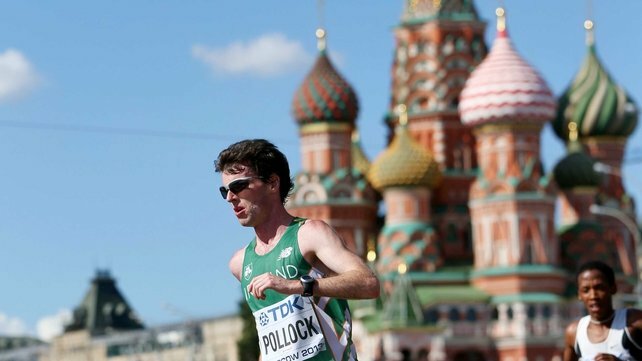 James Sullivan has been chatting to Irish marathon runner Paul Pollock, 21st at the recent World Championships in Moscow. Paul Pollock is an elite distance runner from County Down, Ireland. He represented Ireland at the 2012 World Half-Marathon Championships in Kavarna, Bulgaria, finishing in 34th place. At the 2013 World Championships in Moscow he finished in 21st place in the marathon. His current PB for the marathon is 2:16:30, a clocking he achieved at the 2012 Dublin Marathon. James: Thank you for taking the time to talk to The Running Review. Easy question to begin, how did you first get involved in athletics? Paul: I was 17 in August 2003 when my brother Conor first dragged my down the country to run a small road race, the Monaghan 5k. I had never gone running before and was in no way healthy or fit by any definition of the word. However, I managed to run roughly 17.30 and was first junior home. Despite this, the race was definitely not what I would have called enjoyable. Conor realised that I must have some talent and so forced me to start training with his athletics club at the time, Abbey AC. While there I met my first coach Bobby Rea, an inspiring, energetic man who taught me the love of running. The first few months were tough, incredibly tough. There was a lot of vomiting, pain and the humiliation of getting beaten by virtually everyone in training. I wanted to quit many times, but Conor, mum and dad had more belief in me than I did myself at that time and made sure I kept at it. As time went by my love for running and the members of Abbey AC grew until they became like a second family to me. You see a person’s real personality when they lie exhausted at the end of a hard session. There’s a mutual understanding that what you have just done is something special, something most members of the public will never understand or experience. Bobby unfortunately passed away only a few years later and I drifted away from running as the Abbey AC club folded without Bobby pushing things forward. I graduated in medicine from Queen’s Belfast in 2010. By chance, during that first year of work I went on holiday to Lanzarote with another doctor and triathlete Johnny Boylan. Whilst jogging along the volcanic rocks under a scorching sun with Johnny and his triathlete club, I made the decision that it was time that I gave running another go. With the London Olympics the following year, my main goal was clear. I wanted to run in the Olympics. My other brother, and UK athletics sports doctor, Noel put me in touch with my current coach Andy Hobdell and his world class training group. Things clicked between us and I’ve now been listening to his advice and direction for the past 2 years with good success. Paul: At home, being the youngest of four children, sports were always on the television. Whether it was athletics, swimming, cycling or any sporting event we would watch it. There are definitely golden sporting memories that stand out clear in my mind but I never had an athletics idol as such. I have obviously had individuals in my sporting life, be they friends or family, who I respect and listen to. However, I believe that instead of idolising certain sporting individuals I would rather look them in the eye and put my toe on the line beside them in competition. Once you idolise someone you accept that they are better than you. And once you believe that, you have already lost the competition before it has even started. James: When did you realise that the marathon distance would be your future in the sport? Paul: To be honest, at the moment my focus is on improving my track times over 5k and 10k. I think I am more suited to the 10k than the marathon. Over the next six months or so, I hope to run times over the 10k distance which will prove to me that I am capable of competing with the best in the major championships. Ultimately I will return to marathons as the feeling at the finish line of them is so unique, so different from any feeling you might experience elsewhere. It’s a feeling I would recommend most people to experience at least once in their lives. Paul: One of my weaknesses, as apparent by my many injuries in the past, is my impatience. I want to be fit now, I want to be fast now, I want to be the best now. Running doesn’t work like that. I’m starting to learn that it’s a long, slow journey that can’t be rushed. It’s a sport where repetition and consistency are the gateways to success. My greatest strength is that I believe I know how good I might be. I believe that I can run times that if I told other people they would laugh and say that I have no chance. I’ve now surrounded myself with a team that I hope can bring out my very best, that can push me to the successes that I want to achieve. My greatest strength is my ability, physically and mentally to run hard, to run fast and never give up. Well that’s the idea anyway! James: At the recent World Championships in Moscow you finished in a highly credible 21st place in your debut major championship marathon. Can you put that experience into words? Did you expect to perform so well? Paul: As an athlete I always want more than what I actually achieved. I came 21st. That’s twenty people who beat me that I believe with time I will be able to beat. Yes, of course I enjoyed the experience of racing for my country in a major championship but if you ask me in ten years what my best athletic performance was and I even think of Moscow then I’ll be very disappointed. It is a good start to my athletic career and it is a solid placing but hopefully there is much more to come. James: In Moscow you were the second highest ranked European. How much confidence does this result give you ahead of the European Championships next year? Do you believe you can strongly contend for a medal in Zurich? Paul: I didn’t realise that I was the second European until I saw the results and it definitely is a confidence boost looking forward to next year. However, there are a number of strong medal contenders who for whatever reason were not present in Moscow. I’m not naive enough to think that it will be easy walking in Zurich but I would be lying if I said that a gold medal isn’t my ambition. I believe if I get through the next 12 months injury free then I should definitely be able to be a realistic contender. The fact that Ireland is strongly targeting the marathon team event at the same competition is an additional bonus. The sport of marathon running is starting to return to Ireland and hopefully we should have a team capable of medalling which would be a great day for Irish Athletics. James: Away from your own event, how did you enjoy the experience of being part of the Irish athletics team in Moscow? Paul: I am always proud to wear the Irish vest and never take it for granted. The opportunities to run for your country are limited and whenever one comes along I want to do myself justice. Outside of my own competition I found the whole experience slightly different than what I was expecting. As I was racing on the second last day most of the other Irish athletes had already competed and left Russia by the time I had arrived. It would have been great to watch some of their races and support the team but sadly that didn’t happen. However, it was an amazing experience to see Rob walk his way to gold and then see the medal ceremony in the stadium after. James: Were you disappointed there was no Irish broadcaster, nor any major Irish broadsheet newspaper reporters present in Moscow, especially given the gold medal winning performance of Rob Heffernan? Paul: I understand that at the moment, athletics is a minority event in Ireland and doesn’t have the same superstars that can pull in public viewers or readers as other sports do. For me, running is one of the purest and truly global sports. To excel in running you literally have to be the best in the world. In an ideal world if media and money were directed towards sports in proportion to how hard you need to work to be the best then I believe running would be near the top of the list every time. But it is not a fair world and it is up to athletes to capture the imagination of the public so that they will want to watch and follow our sport. James: You have recently made the decision to train full time. Can you tell us a bit more about that? Paul: When I first left my job in 2011 to take up running and make a serious attempt at making the Olympics, the plan was always just to run for that year, compete in the Olympics and then return to work. Unfortunately, I got injured six months later and that was my Olympic dream over. I returned to work in Belfast but felt like I had unfinished business with the running. I was still in close contact with Andy, my coach based in London, and I decided that I would work for one year and then return to the running. In that one year of work, I would try and get a good base and get as high mileage weeks in as the job allowed. It naturally followed that since I enjoy racing I might try the October Dublin marathon. After performing reasonably well, I decided to do London and then got picked for the Worlds and here I am now. I left my job in August three days before the Worlds. I believe I have a good base of strength and hopefully for the next year I’ll be able to make a big push to becoming a real contender on the world athletics stage. Paul: Every week is virtually the same. Running is about patience and consistency. There is no magic secret. Training is nothing different to what most other runners seem to be doing. Sunday long run, Monday two easy runs, Tuesday session with recovery run that evening, Wednesday two easy runs, Thursday tempo session with recovery run that evening, Friday one easy run, Saturday session with recovery run that evening. And that’s essentially it. If you do those 100+ miles per week for months on end it is inevitable that you will get fit and strong. Paul: Sunday is my best and worst day of the week. There is no worse feeling than waking up on a Sunday morning knowing that you have a twenty miler to do, especially if the weather is terrible. It is the one run that I find mentally tough to just get started. Once I’m out running it always goes well but just getting out the door is such an effort. That said, the feeling on a Sunday afternoon, coming in the front door exhausted after a hard long run is the best feeling in the world. I love that feeling of exhaustion where something as simple as standing up is such an effort. Most of my Sundays are spent lying on the sofa constantly eating. It’s a great feeling and my favourite time of the week. James: Do you do any cross training and if so what type, how often and why? Paul: No, I don’t do any cross training. At the moment I’m injury free and running hard. I don’t think I would have any energy to cross train even if I wanted to! James: What are your views on Planned Marathon Pace runs for club and recreational runners? How long should these be and how many should be undertaken in a training program? Do you do any and how do they help? Paul: I am definitely for anything that promotes the sport of athletics in the country. In terms of specific build up to marathons, the long run is definitely essential. Most Sundays my long run would consist of twenty miles, normally somewhere in the region of 1 hour 40-50 minutes. Race pace at the moment would be around the 1 hour 40 mark so I would do those runs marginally slower than that. Normally my last long run would be 3 weeks before the marathon and then the weeks after that I would come down to 15 miles on the Sunday. Around 5 weeks before race day I would try to add in a couple of extra miles and do a 24 miler at the same pace just for an extra confidence boost. James: There are some who believe that the marathon qualification standards for major championships are much softer than those for track and field events. What are your views on this? Paul: I would definitely agree with that. However, marathon races have the scope for many more entrants than track races could ever afford. I think to entice the public to watch there should be no reason why some of the best marathon runners in the world can’t compete. I don’t think anyone wants to watch or compete in a marathon where there are only 8 or 10 guys running. In addition, most athletes can only normally compete in three marathons a year which means that there are only three chances to run qualifying times. I wonder how many 400m or 1500m runners would hit the qualifying times if you said that they can only race two or three times in the year. James: What are your views on doping in athletics? Paul: I imagine my views on doping are similar to most other athletes. Doping is cheating. To me, there is no difference to injecting drugs into your arm than jumping on a bike halfway through the race. Running is about pushing your body to its limit. It must be a combination of mental and physical strength. If you take drugs, I don’t see how you can look yourself in the mirror and be proud of what you have done or are doing. Don’t get me wrong, I can see why certain people may do it but I feel pity for those that do. This is a sport that I love, not because of the publicity or rewards that I might get but because I know I am pushing myself to be as fast as I can possibly be. Yes, I would probably be faster if I took drugs but then again, I would probably be faster if I had springs on my shoes. That is not what running is about. I want to be able to stand on the Olympic podium and say this is where hard work gets you. This is where years of training and dedication gets you. Drug cheats will never be able to do that because they will always know in themselves that it wasn’t their hard work that got them to that medal. In terms of bans for athletes caught doping, I am of the opinion that they should never be allowed to compete internationally again. They should not be allowed to compete at a major championships or outside of their own country. It is up to their own country to decide whether they are willing to let them still compete internally. James: What one change would you most like to see happen in Irish athletics over the coming years? Paul: I want to see a much bigger drive in schools to get teenagers involved in the sport as there is undoubtedly talent which is being missed. However, this will only occur once public interest in athletics has again been sparked. Growing up, I remember sitting around the television watching Sonia compete and the great sense of national pride that it inspired. Hopefully in the next few years I will be part of the regrowth of Irish athletics and get to see new Irish superstars being born. James: That’s great Paul. Thank you for your time and the very best of luck in 2014. Paul: Many thanks James. I think it’s time to go for another run!